Manchester United are moving ever closer to announcing the first transfer of the summer after reports emerged that Brazilian international, Fred has completed his medical. The 25-year-old was spotted at the club’s training ground, Carrington and has agreed a five-year contract, according to Daily star reports. It is believed that we will pay Shakhtar Donetsk around £52.5m for his services. There are also talks that he could be handed the no. 16 jersey last worn by club legend, Michael Carrick or get the number 8, should Juan Mata move up to no. 10. Fred had spoken about links to United after Brazil’s 2-0 win over Croatia at Anfield, where he came on for an eight-minute cameo. It suits all parties for the deal to be done quickly. 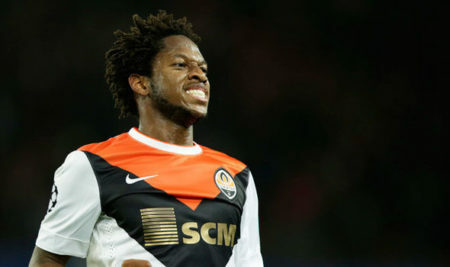 His international boss Tite wants the move confirmed well before his side’s World Cup opener against Switzerland in Rostov on 17th June, so that Fred’s mind can be entirely on providing competition for the likes of Casemiro and Fernandinho in the midfield. Equally, a swift deal would give Shakhtar more time to identify a potential replacement while we can deliver an early statement of intent. Fred, who has been at his current club for five years since joining from Internacional and has scored 15 times in about 155 appearances, is the type of player that our midfield has been crying out for. He is industrious, dynamic, energetic and possesses a wide array of technical qualities, which could make the Belo Horizonte born player the perfect foil for Nemanja Matic and Paul Pogba. Having shone in the Champions League last season, United’s new boy will be no stranger to the big stage.